For a personalized transformative beauty experience, just walk into Salih Salon on Manhattan’s Upper East Side. No mere cut and run, this lauded salon is where innate style and inspired vision collide. 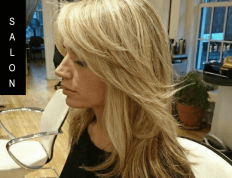 A true neighborhood salon with a welcoming atmosphere and lively conversation, Salih Salon draws both a loyal local clientele and world-wide visitors on a daily basis. Master stylist and owner Salih Cakirca brings heart and soul to his establishment. His working philosophy emphasizes the pursuit of happiness and a desire to put a genuine smile on the face of everyone sitting in his chair… a smile that lingers long after walking out his door. Happiness is not a simple one-cut-fits-all equation. Nor is it strict adherence to what’s hot on the runways or trendy in the glossy magazines. Salih and his team of expert stylists are insightful creative directors, catching subtle lines, angles, and details that make a world of difference for any hair cut, color, treatment and style. They are a team of artisans and craftsmen, finding what respects each client’s unique shape, complexion, and persona. They pinpoint and reflect each client’s emerging identity and aspirational goals. And what manifests from this makeover is an internal shift from an external change; plus a newfound bounce of confidence. When Salih talks about a makeover, he doesn’t mean the usual marketing buzzwords. His goal is to give each client a better look, a personal evolution, and a different perspective. His perfect lining and finishing is indicative of his authentic talent and attuned perfection. But the meaning and message infused in these makeovers is connective to Salih’s dynamic energy, making Salih Salon a center of impeccable service and superior style. Styling is creating. It’s giving people the best look in their own natural way. You have to find that. You have to listen to people, focus and catch what they really want, what they want to look like, the change they’re dreaming for. I try to make that dream happen.